Pittsburgh, PA – The Pittsburgh Water and Sewer Authority (PWSA) has started applying the corrosion control additive orthophosphate to the drinking water. The decision to use orthophosphate comes after an extensive, year-long study conducted by local and international water quality experts as well as comprehensive regulatory approvals from the Pennsylvania Department of Environmental Protection (DEP). PWSA expects that orthophosphate will reduce corrosion from water services lines made of lead. 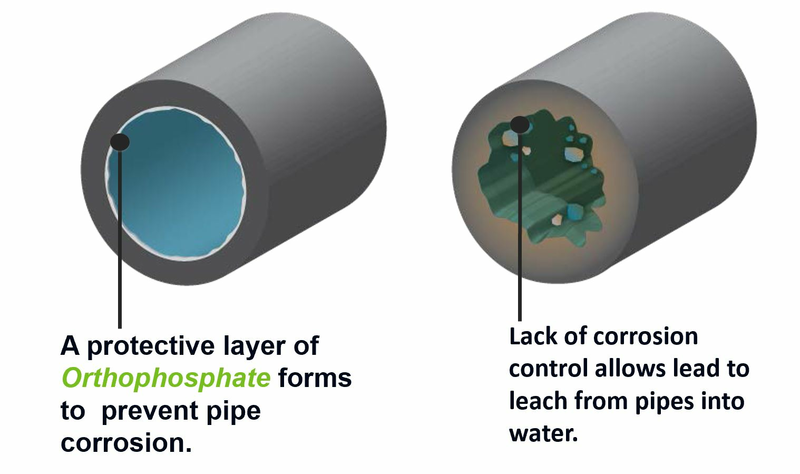 Orthophosphate is a food-grade additive that forms a protective layer inside of lead service lines, creating a barrier between the lead pipes and the water flowing through them. It is approved by the Environmental Protection Agency (EPA) and used in water systems across the world, including sections of the City of Pittsburgh served by Pennsylvania American Water Company. Per its permit with DEP, PWSA is applying orthophosphate to water in stages. Starting today, it is added to the Highland II portion of the water distribution system at the Bruecken Water Pump Station. The Highland II system serves approximately 25 percent of PWSA’s customers. PWSA will add orthophosphate to the Lanpher and Highland I systems in the coming weeks. The rendering below illustrates where orthophosphate is applied in the water distribution system. During the initial application period, orthophosphate may cause temporary water discoloration. Customers who notice discolored water should follow the instructions outlined below. PWSA’s Water Quality team will perform ongoing water quality monitoring and analyze hundreds of water samples during the implementation of orthophosphate to ensure it is performed as smoothly as possible. More information and answers to frequently asked questions about orthophosphate can be found here. “We expect orthophosphate to solve a huge amount of our lead problem,” said PWSA Board Chairman Paul Leger. “This is a big step forward in protecting our customers,” he said. “Orthophosphate addition marks another major milestone for our Community Lead Response. This treatment upgrade, which has shown to be effective in water systems across the country, will help protect customers who still have lead service lines,” said PWSA Executive Robert A. Weimar. “We want to thank DEP and the Office of Mayor William Peduto for working with us as we implement this critical project,” he continued. The 2019 lead line replacement program is also now underway and will replace over 4,500 lead service lines. Customers can learn more about lead in water and PWSA’s Community Lead Response programs at lead.pgh2o.com. PWSA will continue to flow water from fire hydrants throughout its distribution system to prepare the insides of pipes for the new orthophosphate-treated water. In addition, flushing will help bring the orthophosphate-treated water to customers more quickly. Over the next few months, customers may see crews opening hydrants and performing water quality monitoring.